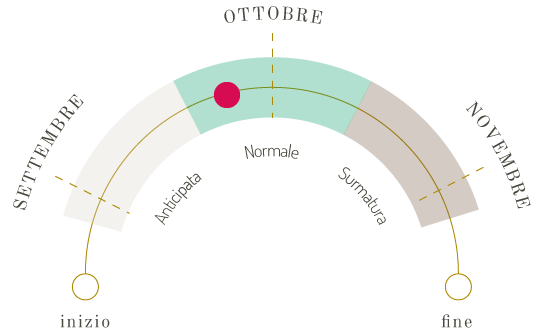 Manual harvest when the right balance between acids, sugars and pH is reached, usually between the end of September and the beginning of October. A structured white wine with an alcohol content enhancing the most sophisticated and flavoursome dishes, Verdicchio family proposes Classico Superiore, a tribute to the culture of wine and the elegance of Le Marche DOC wines. Verdicchio vineyards are located in the hilly hinterland of central Le Marche. Soil consistency is medium tending to clayey, with southwest exposure. “Vinification” goes through various phases: pressing of clusters, extraction of grape must, cleaning of the must followed by static and cold decantation, and thermo-controlled fermentation. Refinement period lasts four months in steel and three months in bottle. Perfume: Aromatic notes, very pronounced floral and fruity aromas, like white flowers, Summer fruit, almond and broom. Flavour: In the mouth it confirms the smell sensations: it is elegant, harmonious, soft, full-bodied with an almond aftertaste, typical of Verdicchio. As an aperitif, with hot and cold appetisers, white first courses, mushrooms, truffle, white meats; excellent with any fine cuisine fish dish.